It was originally hoped he would recover in time for the start of the Premier League season, but the 23-year-old was forced to undergo another operation after damaging scar tissue around the initial injury in training in August. 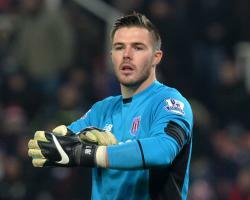 Butland resumed training last month and has made progress during the international break, with Stoke boss Mark Hughes hopeful he might be able to rejoin the squad sometime around the turn of the month. That is the only thing that we are thinking about at the moment." He understood the circumstances that he was coming into, but he has stood up to the challenge and has exceeded everybody's expectations." Whelan suffered a hamstring injury during the international break, limping off midway through the first half of the Republic of Ireland's win in Austria last weekend, while fellow midfielder Geoff Cameron is still injured. United States international Cameron has missed the last two matches after hyper-extending his knee and has suffered a setback in his bid to regain full fitness. Better news for Hughes sees Marko Arnautovic return from suspension while Xherdan Shaqiri has recovered from his hamstring problem and is back in contention. "Shaq is fine, but Geoff, unfortunately, won't be available as he has had a little bit of an issue with the knee that needed calming down and we've been told that he just needs to rest a little longer."